Sonik Sports continues to widen its hugely popular Vader range of carping hardware with the launch of two new compact freespool reels. Just the job for targeting small to medium-sized venues or ‘runs waters’, the reels come in two sizes (5000 and 6000). They weigh 430g and 435g, and boast a micro-adjustable front drag and an independent freespool rear drag adjustment. Build quality is impressive. The reels are made from a light but hardwearing graphite material (with a stainless steel main shaft), and come with solid aluminium handles, oversized line-friendly line clips and two anodised aluminium spools. With a gear ratio of 5.5:1, there’s no lack of cranking power either. Having used both reels teamed with Sonik’s Specialist Barbel rods to great effect on the River Trent, I can vouch for their reliability and solid performance. For me, the larger 6000 model just gets the nod between the two, as its larger, wider spool is suited to heavier lines. It also has slightly more cranking power, very handy when retrieving heavy leads and swimfeeders at long range. The clutch adjustment on the front of the spool, and the tension settings for the freespool facility, are functional rather than precise, but they won’t let you down. All-black aesthetics and understated graphics give these Soniks a classy look, and for the asking price you won’t find a better reel anywhere. mitchell’s iconic 300 reel is back! The legendary Mitchell 300, that has quite possibly been responsible for more match wins than any other reel, has been given an upgrade. Two new models – the 300 and the super-slick 300 Pro – measure up perfectly to all float and feeder tactics. The original Mitchell 300 was widely considered to be the first spinning reel suitable for match fishing. This latest version, clad in a very classy-looking black and silver livery, is fully loaded with the latest technology while still maintaining many super-cool retro elements. The re-build includes a new Bail Halo rotor for loads of winding power, while six bearings provide smooth, trouble-free running. The new low-profile multi-disc front drag is quick, intuitive and infallible, while a fast 5.1:1 gear ratio generates 0.67m of retrieve per oscillation. The new all bells and whistles 300 Pro raises the bar even higher. Super light and smooth-running, the reel features a self-lubricating carbon hybrid drag system that is not affected by heat build-up, and that irons out any spikes in line tension resulting from setting the hook or head shakes from big fish. To that you can add a super-fast 5.8:1 ratio retrieving 0.84m of line per oscillation, and no fewer than 10 ball-bearings for a seamlessly smooth wobble-free performance. Mitchell’s new Bail Halo rotor is also deployed on the Pro 300, which comes with a shallow, braid-friendly aluminium spool and a spare. Both new reels are also available in 308 versions. Mitchell has entered the reel glamour stakes with the release of these stunning Avocast Black Editions. 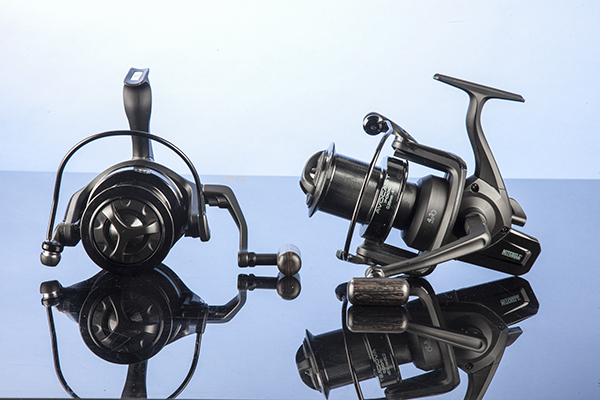 The all-black big pit-style reels have 7000 and 8000 body sizes, although in profile they do look very compact. These distance-casters pack in many technical features of use to the modern carper or big-fish specialist. A greased felt multi-disc precision front drag is quick easy to set, and doesn’t over-tighten too quickly when you’re playing a big fish straight off the clutch. You can’t say that about all new fast-drag big pit reels! Ultra-flat folding handles will appeal to anglers who like a tight set-up… and the 4+1 stainless bearing configuration gives super-smooth slow oscillation that lays line down perfectly across the spool and allows you to cast into the next county without a hitch. Other key features are the impressive 4.3:1 gearing ratio recovering 0.83m (7000 size) and 0.98m (8000 size) of line per handle crank. Long coned aluminium spools hold an impressive amount of line, and you won’t need a Love Island six-pack to handle these reels – the 7000 weighs just 615g. Even better news is that Mitchell has these very carpy winches on a ‘buy two, get one free’ deal. Shimano's stunning new Ultegra Spod XTD will make easy work of spodding, Spombing or – more latterly – Air Bombing. These are three ways of introducing feed quickly, accurately and in quantity to the spot. I reckon that your spod reel should be the best you own – think how much work it gets through in a season. It needs the winding power to retrieve a spod or similar without you having to pump the rod like a nodding dog on a parcel shelf. It also needs to have a brisk gear ratio, and the gears themselves must handle more punishment than any other reel in your bag. To that little lot you must add a braid-friendly spool that delivers a line-lay good enough to cast way over 100 yards with ease. The line clip (or, better still, three) should be able to withstand being whacked time and time again, really hard, by a braided line thin enough to slice its way through anything other than stone. Oh, and did I forget to mention that the clutch mustn’t slip, ever, and the line roller has to be perfection personified to totally eliminate braid spin? Enter the Shimano Ultegra Spod, with all these attributes and then some. The XTD boasts an elongated aluminium cranking handle with enlarged thumb knob, which gives even more winding power and creates an unrivalled sense of balance. Shimano’s unique X -Ship gearing virtually guarantees a wobble-free retrieve. My one criticism is the instant drag system, a wasted feature on any spod reel. However, the front-setting drag can be locked down completely solid, so there’s no slippage when casting a fully-loaded Spomb or spod – good news for your fingers! A 5.2:1 gearing ratio retrieves 124cm/49ins of line per handle crank, while its super slow spool oscillation produces a line – or braid – lay to rival that of the most expensive big pit-type reels. 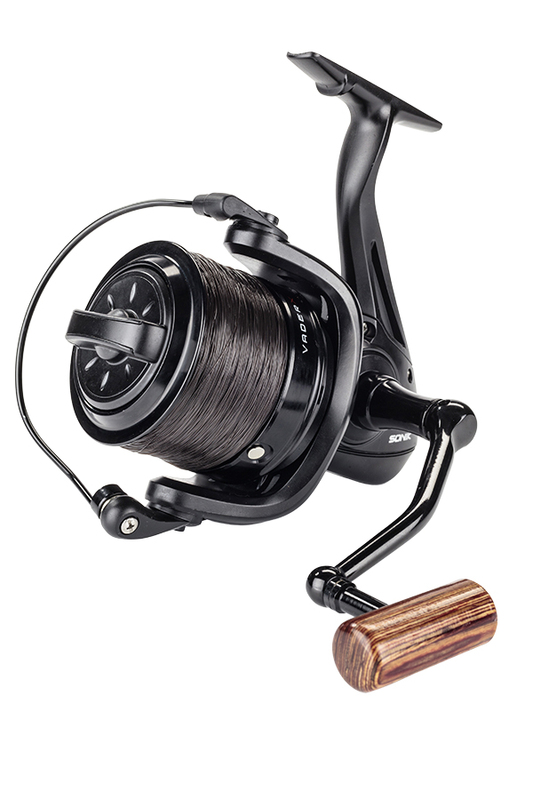 Add all-black looks, a sleek parallel body, and lightweight 630g (22.2oz) feel… what a reel! Shimano's two stunning new reels, soon to be released, look nailed on to become best-sellers. This is not surprising, since they will appeal to match, specimen and carp anglers alike. The compact ‘big-pit’ Ultegra C14+XTC 5500 (black) and Ultegra C14 XSC 5500 (pearlescent) models are based around Shimano’s hugely popular Ultegra 14000 reels that have been embraced by serious carp anglers. But technical improvements, and significant differences between the new models, are readily apparent. The new Ultegras are better protected against water and dust, weigh less than their predecessor, and benefit from Hi-Speed front drag systems. These allow for quick setting post-cast when targeting big carp, so big fish can be precision-played off the clutch without fear of the reel over-tightening or locking up. Better, stronger winding power is provided by Shimano’s top-end Hagane gearing. To that little lot you can add many technically improved parts including a C14 rotor system, beautifully balanced and completely wobble-free. Rounding off the specifications are a super-comfy handle knob and an improved, more discreet line guard that functions better than ever and affords a slight weight saving too. Both models come with a spare spool. Daiwa is poised to introduce its first big-pit reel with a 35mm-wide spool for use with thicker diameter reel lines. The new Emblem 35 SCW 5000C QD scores highly on looks and performance, with cult all-black styling and impressive features. These include a reduced oscillation speed known as Slow Cross Wrap for faultless line-lay and ideal for long-range casting and heavy-duty work. The reel runs wobble-free on six ball-bearings, its 4.9:1 gearing retrieving a mighty 106cm (41.8ins) of line per handle crank. The shallow spools (one spare) hold around 300 yards of line. 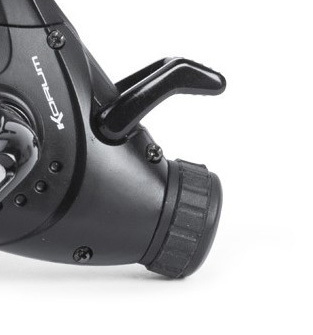 Daiwa’s QD front drag system goes from virtually locked-up to freespool mode in half a turn of the knob. Twist-Buster 2 line management and a rock-solid Air Rotor add to the winding power. The Sonik Vader X 8000 reel will be snapped up by any carp angler looking for quality, looks and value for money. A long-nose spool facilitates long, smooth casts, while its 4.6:1 retrieve rate makes short shrift of rapid line recovery. Features include a large-diameter bail-arm with enlarged line roller, twin line clips, powerful and reliable front drag and a pleasing barrel-shaped wooden handle. It comes with a spare forged anodised aluminium spool. Preston Innovations’ Centris NT reels have taken more than two years to develop – and the results are truly impressive. Three body sizes – 320, 420 and 520 – cover every possible match fishing scenario. The smallest of these, the 320, is best for general floatfishing, while the others will handle heavier float tactics and all feeder and straight lead work. In a classy black and red livery, they all have a spare spool and quick-change double or single handles. And the list of technical features doesn’t end there. The NiTi bail-arm always returns to its correct shape, so it clicks over firmly and there are never any distortion problems. To that, you can add a titanium shaft, full aluminium body, titanium carbon rotor and super-smooth Power Drive retrieve. Super-slow oscillation results in faultless line-lay, while multi-washers make the micro adjustable front drag incredibly smooth and precise. Push-button release allows you to change spools in an instant, and each spool has two line clips as standard, making fishing two lines incredibly simple and accurate. 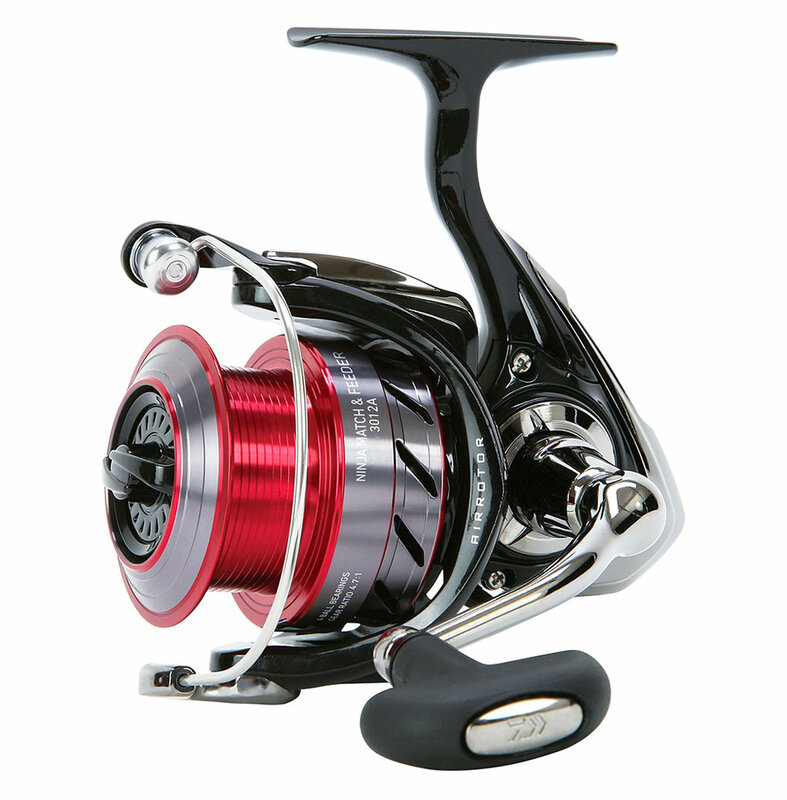 All reels have a 5.01:1 gear ratio and seven bearings. Daiwa's latest addition to its highly acclaimed Ninja range is this versatile Match & Feeder reel in five different sizes. We were really impressed with the original Ninja reels, which are super smart, practical and above all offer great value for money at less than £60 RRP. Now the Match and Feeder boasts an improved Distance Control line clip. And it features slightly revised sizes of 3012 (in single and double handle) and 4012 (in single handle only) options. Good winding power is provided by the geared down retrieve and smoothness is enhanced with 4BB and Infinite Anti-Reverse. There's a bit of a weight saving from the graphite body and you'll get a carefully adjustable front drag. Few manufacturers of predator tackle can boast the complexity, range and depth of Fox’s Rage brand. The latest Prism reels – which, unsurprisingly, complement the new Prism rods – come in C100, C2500 (pictured) and C4000 sizes, and between them are perfect for all lure fishing. Smooth running on six ball-bearings, with sleek clutch systems and a balanced rotor profile, they virtually guarantee a wobble-free retrieve. The ideal companion for any Maver Reality rod, the latest Enigma 300 reel turns in an amazing performance for a model at such a modest price. Ideal for float and feeder work, it runs silky-smooth on nine bearings. Top-end technical features include a double soft dampening line clip system, which prevents snap-offs should you hit the clip a little too enthusiastically. A computer-balanced rotor, titanium-plated line roller, excellent line lay and ambidextrous handle give added reel appeal to this pleasing product. It isn't just the Black Viper Feeder rods that Browning has got right. The latest Black Viper MK FD reels, crafted to cope with the rigours of long-distance feeder work, are their perfect partner. A fast 5.5:1 retrieve speed cranks in an impressive 105cm of line per spool oscillation, and the reel also boasts an oversized wide, shallow spool that copes equally well with braid and mono liines. It can be filled without resorting to lots of backing line, the pleasing end result being faster and longer, consistently accurate casts. The specialist Viper model also features a sophisticated worm shaft gearing which ensures effortless retrieval, even when winching in the heftiest of feeders or leads. Other key features include a non-twistline roller supported by ball-bearings, large surface multi-disc front drag system, aluminium long stoke spare spool, and CNC-made anodised stainless steel handle. You indeed get a lot for your not-inconsiderable outlay. Looking for the perfect companion to the Daiwa Powermesh Float rod? on the heavy side if you’re holding the rod for sustained periods. Air Rotor, Twist Buster, Air Bail and a spare spool all come as standard, and geared-down oscillations furnish the reels with substantial retrieving power. This great looking Fast Drag big pit reel has all-black looks, and its large capacity spool is made for challenging venues, long casts, and the boating out of baits to extreme range. Features include dual spot line clips, line guard spool system, level wind line-lay, and an oversized line roller to reduce line twist on the retrieve. The single-turn front Fast Drag system is easy to operate and precision set, while the CNC-machined ergonomic handle includes an isotope slot, something we’ve never seen before on any reel. In tackle terms your money goes a lot further than it used to. Advances in technology and manufacturing processes mean that features once exclusive to top-end products are more affordable and in general use. Since its launch in early 2016, Leeda’s Concept GT brand has established a reputation for quality products on a budget. The eye catching GT-X reels include two new front drag models and a freespool version. The smallest in the range, the FD30, is ideal for all float and light lure work, while the slightly larger spool of the FD40 lends itself more to feeder tactics. A freespool mechanism and double handle suit the FS40 perfectly to tackling barbel, tench, bream and carp. 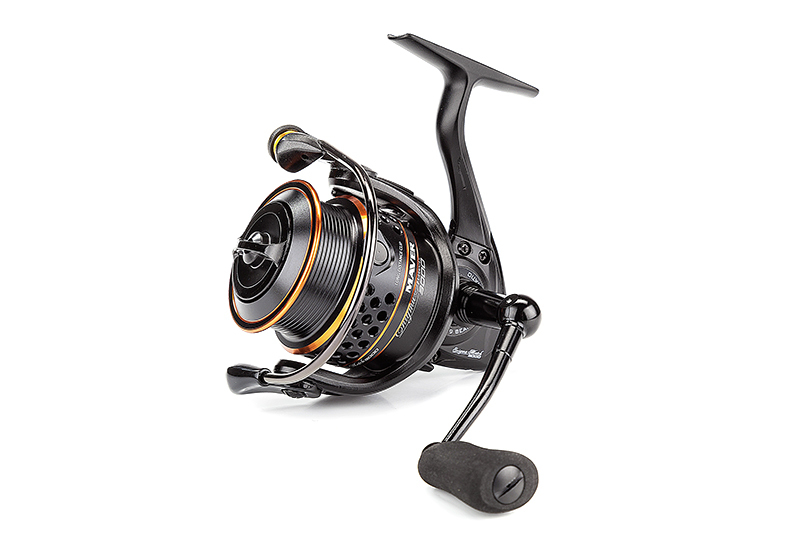 All GT-X reels have five ball-bearings for silky smooth performance, a hard-wearing stainless main shaft, precision double anodised spool (with spare), and interchangeable folding handle. The chunky bail-arms feel solid, while the sensitive front drags can be quickly and easily adjusted while playing a fish, going from fully locked to giving line freely in one full turn on the front spool disk. Ergonomic EVA handle grips and a sleek body design complete the bargain package. Is it just me, or are these new Daiwa 16 TDXs the best-looking match, pleasure and specialist reels ever to grace these pages? Yes, they do carry the sort of price taglikely to draw a ‘you’re having a laugh’ comment from the wife, and telling her they’re must-have kit will cut precious little ice, believe you me. But just look at them… like puppies in a pet shop window, they’re irresistible! The all-new bells-and- whistles 16 TDX reels (the number 16 refers to their year of introduction by Team Daiwa) arrived here in the UK a tad late – but they’ve been well worth waiting for. Their striking red-and-black looks are matched by technical credentials that wouldn’t look out of place inside the cockpit of Sebastian Vettel’s F1 car. Zion carbon bodies and rotors offer super-lightweight handling, but with more strength and power than any aluminium-bodied reel. Housed within is a gear alignment system with zero distortion, no matter what the weight loading, matched with rotation so smooth that stirring your morning cuppa feel like hard work by comparison. If that still doesn’t impress, then check out the other patented Daiwa features – precision Quick front drag system, HIP high-impact line clip, Air-bail, Twist Buster and Digi-Gear. The icing on the cake (and not before time) is a spare spool included as standard. There are six 16 TDX reels to choose from, with single and double handle options, enough body sizes to suit all angling styles, and even a high-speed version, sure to find favour with the discerning lure angler. Feeder fishing continues to be the most popular technique in the UK, and these latest specialist Feeder reels from Korum should prove hugely popular. They come in 3000, 4000 and 5000 body sizes, covering everything from large open-water natural venues to rivers, canals and commercial carp fisheries. Ample winding power, especially with the 5000 model, will cope with the largest and heaviest Method or open-end feeders, while the two smaller versions are ideal for lighter flatbed, cage and maggot feeders. Sturdily built to withstand the rigours of repeated casting and retrieving, all three models feature perfect S-Stroke line lay, super-smooth front drag systems and precise carbon steel bearings. Other key features include an anti-twist titanium line roller and an oversized aluminium bail-arm that combine to make the use of thicker gauge reel lines painless and trouble-free. To that little lot you can add machined and anodised (spare shallow) spools, both with line-friendly line clips, a compact fold-away ambidextrous handle with a comfortable rubber grip, and a strong but lightweight graphite body and rotor. Shakespeare has just unveiled these eye-catching Cypry reels. The freespool models, in three sizes, cover all aspects of carp fishing. The 40 body size is ideal for small commercial match carp waters, while for big open-water venues there’s the 80 reel with its long-cast spool to achieve maximum distance. Keen prices are matched with plenty of key features such as large-diameter bail arms, aluminium spools, proven winding reliability, retrieve ratios of between 4.1:1 and 5.2:1 and super-smooth grease felt drag systems. To go with these, Shakespeare has also released a range of three matching Cypry carp rods. Shimano's new Ultegra 2500 FB reel looks ideal for all float, light feeder and lure fishing applications. In eye-catching silver and gold livery, it offers superb winding power thanks to the state-of-the-art cold forging technology used in its Hagane gearing system. The reel lacks a backwind facility, but this shouldn’t been seen as a negative, since its superb precision front drag system – itself a work of art – can be instantly adjusted and relied upon to safely control any hard-fighting fish. The Ultegra boasts many other key Shimano features, including the latest G Free body technology. This shifts the reel’s centre of gravity closer to the rod, reducing hand fatigue and making casting more comfortable. The stiff XT-7 body material offers perfect protection and support for the Hagane gears, X-Ship line-lay system and shielded A-RB bearings, allowing them to work to maximum efficiency. Rodiac Freespool reels have now joined Korum’s impressive Front Force, Snapper, Feeder and Neoteric ranges. with high-diameter lines on big open-water venues. Technical features include a lightweight graphite body, anti-twist titanium line roller, oversized bail-arm with water drop bail holder, and a hard-wearing anodised spool – with a shallow one also included in the package. High ratio gearing, a highly accessible freespool facility and precision front and rear drag settings are likely to endear these reels to big-fish fans, since they can be pre-set to suit the weight of fish likely to be encountered. Fine adjustments can then be made to suit changing swim conditions, such as extra water coming through, without fuss. A bonus to left-handed anglers is that the K-Fold aluminium handles have an ambidextrous fitting, so the handle can be positioned to suit. All three sizes have a gear ratio of 5.5:1 and boast five stainless and one needle bearing. Line capacities are 265 yards of 10lb, 340 yards of 10lb and 350 yards of 12lb, respectively. BUY NOW - CLICK FOR BEST DEAL!